I love when a craft idea comes from taking a random material and noodling over it until finally coming up with something to make with it! 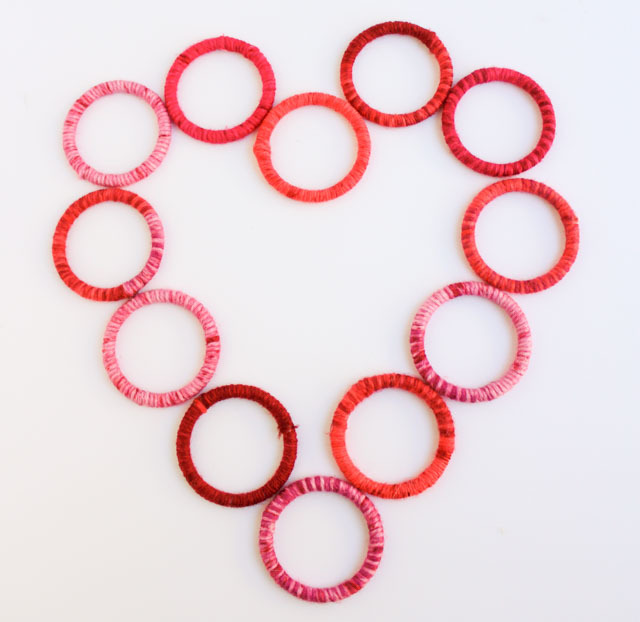 This yarn-wrapped heart wreath came about thanks to these plastic rings, which I had leftover from another project. I initially tried experimenting with using them individually, but then the idea of forming multiple rings into a heart hit me! The most satisfying part of the process is when an idea actually works out, sometimes even better than I had envisioned. I’m so excited with the results, and hung the heart in my office just in time for Valentine’s Day. 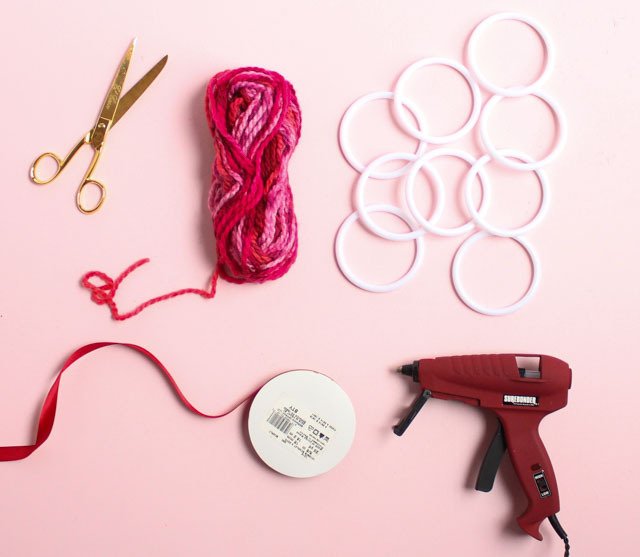 Read on to see how you can make your own yarn-wrapped heart wreath for under $10! 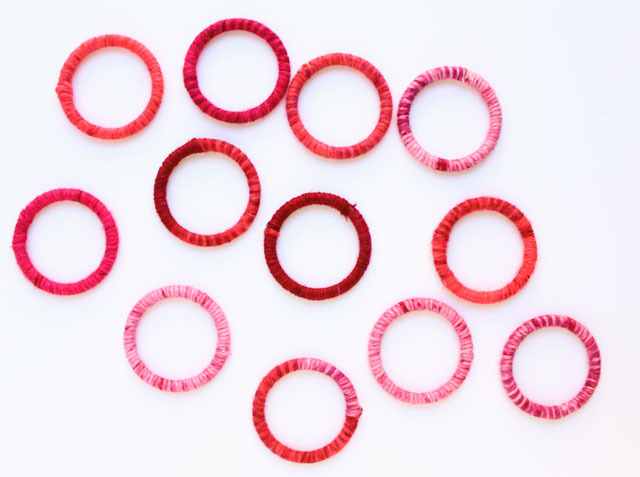 You can buy a 12 pack of these plastic mini wreath rings from Oriental Trading, which is just the right amount for making this wreath. I wrapped the rings with variegated pink yarn and formed them into a heart, using a little hot glue and yarn to hold them together. I just love the look of variegated yarn – it adds richness and visual interest to a project like this. FYI – while I show ribbon in the supply image above, I ended up using two small nails to hang my heart wreath rather than the ribbon. 1. 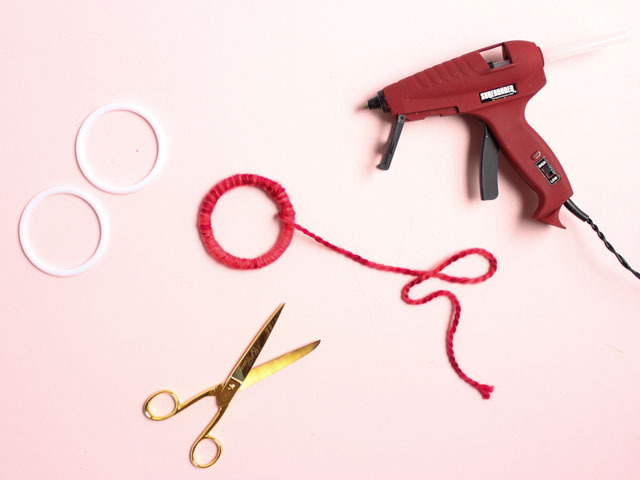 Wrap each of the rings with yarn, securing the beginning and end of the length of yarn to the ring with a dab of hot glue. I found the quickest way to wrap the rings was to cut about 2 yards of yarn from the skein and bunch it up into a ball to fit easily through the ring while wrapping. Repeat until you have wrapped all 12 rings. 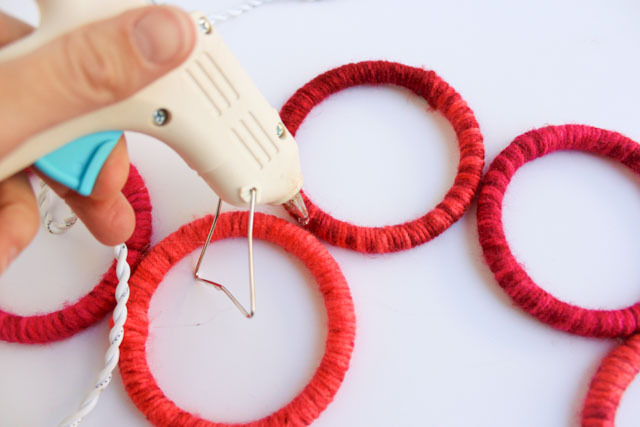 This goes quickly and is a great craft to do while watching your favorite show on TV! 2. 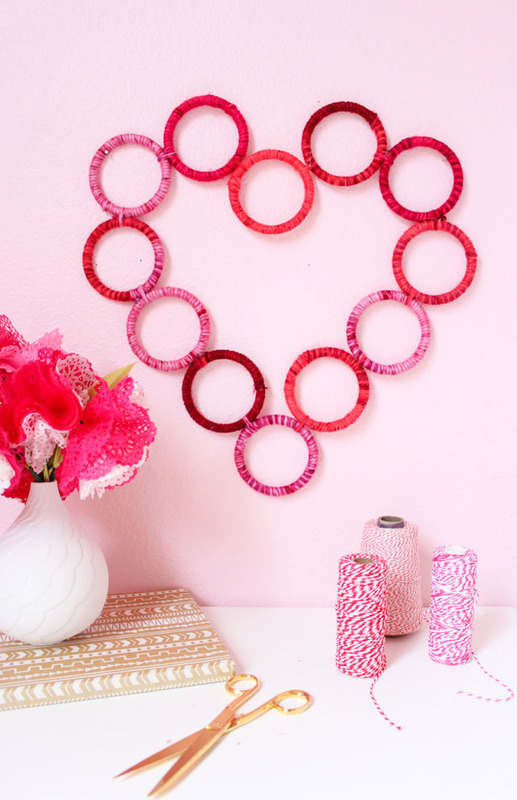 Arrange the rings into a heart pattern. 3. Once you have the heart shape you want, add a small dab of hot glue between each of the rings where they meet to hold them in place. 4. 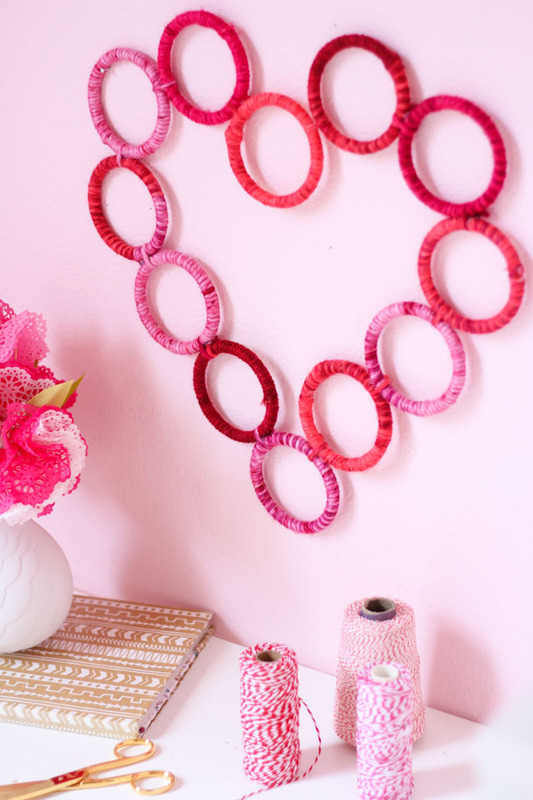 Flip over the heart and tie a small length of coordinating yarn around the hot glued area with a double knot. 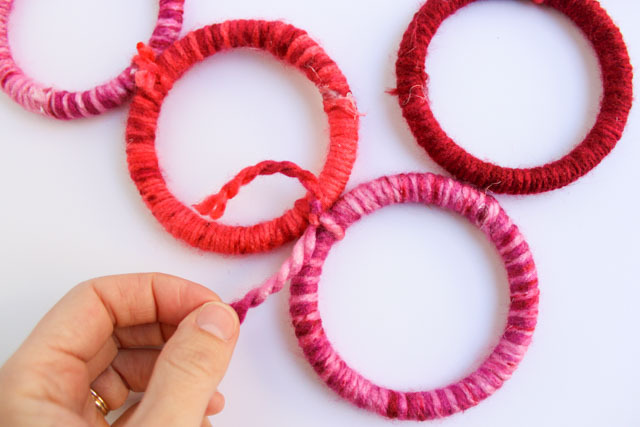 Trim any excess yarn. 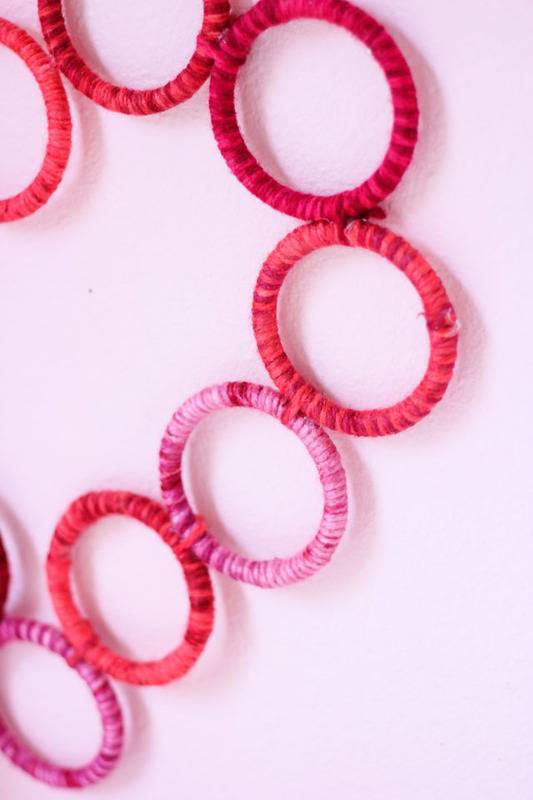 The addition of the yarn will ensure the rings will not come apart once the heart is hung up. 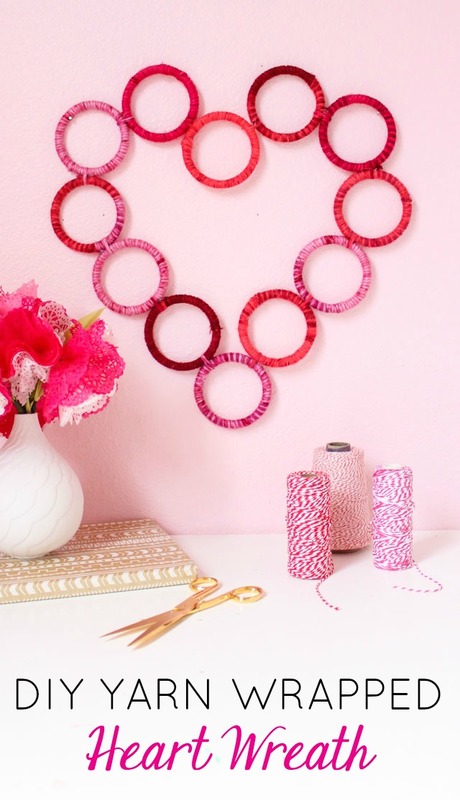 Thank you to Oriental Trading for providing the mini wreath rings for this post.